Figure 1. Canker on stem, and inter-veinal discoloration of leaves above the canker caused by northern stem canker. Photo by Jaime Cummings. As part of 2014 research projects supported by the New York Soybean Check-off Program and the Northern New York Agricultural Development Program, participating Cornell Cooperative Extension Educators have been scouting soybean production fields, recording observations on diseases, and sending plant samples to the Field Crop Pathology Laboratory at Cornell University for positive diagnosis of disease problems. A serious disease called ‘northern stem canker’ was confirmed for the first time in New York soybean fields. It showed up in samples from soybean fields in Jefferson, Livingston, Niagara, Ontario, Orleans, Seneca, and Wayne Counties collected by CCE Educators Mike Hunter, Mike Stanyard and Bill Verbeten. The disease was diagnosed at Cornell based on characteristic symptoms and the laboratory isolation of the causal fungus and confirmation of a portion of its DNA sequence. Soybeans are also being scouted in other areas of New York in 2014, but so far this disease has not been detected outside of the seven counties mentioned above. Northern stem canker (NSC) is caused by the fungus Diaporthe phaseolorum var. caulivora and differs from a related fungus, Diaporthe phaseolorum var. meridionalis, that causes southern stem canker throughout the southern U.S. NSC occurs in most Midwestern states and in Ontario, but this is, to our knowledge, the first confirmation in New York or the northeastern U.S. Reported yield losses in the Midwest have ranged from minor to in excess of 50%, so the presence of the pathogen is considered a significant factor for soybean production. Yield loss is often a function of the relative susceptibility of varieties that are planted; varieties vary from susceptible to resistant. If NSC becomes more prevalent in New York, selection of resistant varieties may become more important for New York producers. Figure 2. Internal and external stem symptoms caused by northern stem canker. Photo by Jaime Cummings. The foliar symptoms of NSC are similar to those of other soilborne diseases that restrict the movement of water and nutrients to the leaves. So NSC can be confused with brown stem rot and sudden death syndrome, all of which result first in yellowing and then browning of leaf tissues between the veins during pod-filling stages. What is distinctive about NSC is the stem lesions called cankers that form near nodes and often girdle the stem, resulting in wilting and necrosis above the canker (Figure 1). Dead leaves remain attached to the plant and turn blackish. Cankers often have a reddish margin and gray center (Figures 1 & 2). Symptoms in the interior stem initiate as a slight browning at the nodes and then may progress to complete browning and deterioration of the pith, while the roots remain symptomless (Figure 2). Necrotic stem symptoms may be confused with those caused by white mold or Phytophthora stem rot. Infection by the fungus occurs early in the season, from spores splashed by rain from the soil to the stems; rainfall and warm temperatures favor epidemics. 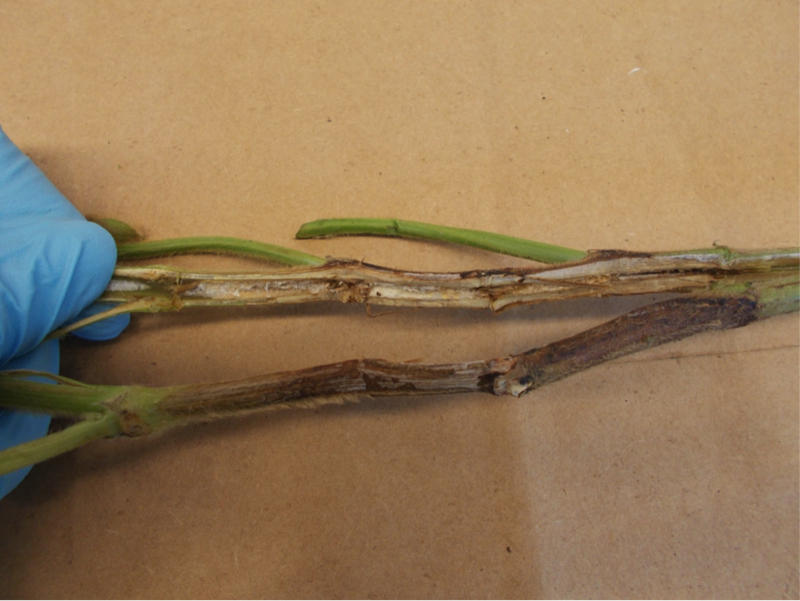 Because infection occurs at early stages (around the three leaf stage) of the crop, foliar fungicides applied during flowering and pod-filling stages will not be effective in suppressing NSC. The fungus survives on soy residues in the field for many years, and produces its infective spores on these residues. Some research suggests that other legume crops such as alfalfa and a number of weed species can harbor the fungus between soybean crops though the importance of these associations is not well established. Deep plowing of infected soybean residues and multiple year rotations with corn or small grains may reduce the potential of NSC in a subsequent soybean crop. The pathogen can also survive in and be transmitted by infected seed, such that fungicidal seed treatment can reduce the chances for introducing the pathogen into new fields. The most important thing that a New York soybean producer can do at this time is to learn to recognize the symptoms of NSC and other soilborne diseases and to get a diagnosis of problems that they observe in their fields. 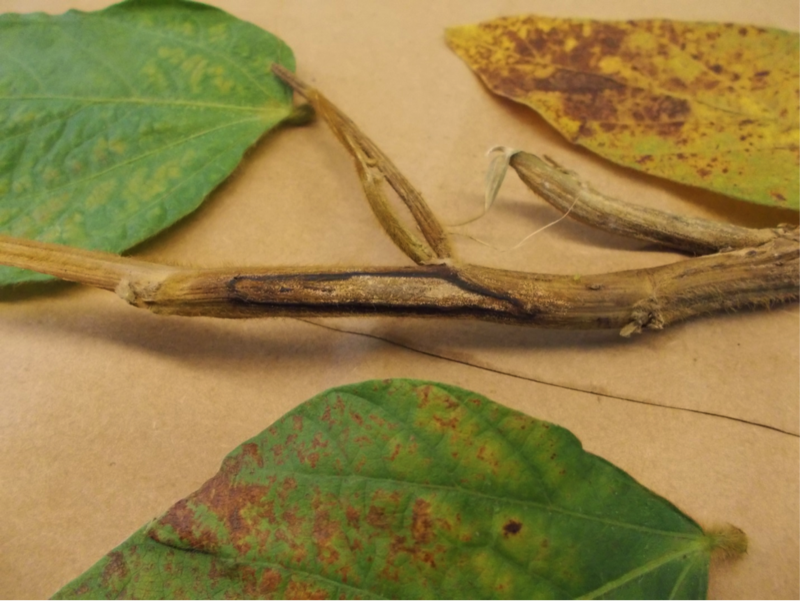 If NSC or other soilborne diseases are confirmed, producers should talk to their seed supplier and order soybean varieties with appropriate levels of resistance for the soilborne diseases observed on their farm. Acknowledgements: This research received financial support from the New York Soybean Check-off Research Program, the Northern New York Agricultural Development Program, and Cornell University Hatch Project NYC153473.